This post is one in a series of tips for making your small business run better and is sponsored by UPS. Scheduled communication may be one of the most powerful team and accountability building tools available when done the right way. Meetings are an essential aspect of getting things done, collaborating and delegating, but for many they are the bane of business life. People actually leave companies because of the life draining nature of their meeting culture. This commonly accepted feeling about meetings comes about because most people have been trained to handle meeting in one of two ways. One is the “I hate meetings, so just come to me if you have a problem” method. Of course this is quite possibly the most frustrating approach for all concerned. This approach leads to lots of wasted time and the every ten minute or so interruption. The other approach is what I refer to as the “I’ve called a meeting, but it’s really a reading” approach. In this approach managers read from a list of to-dos that could have been sent via email and then propose some things to try to get buy in. This second approach eventually leads to adopting the first “I hate meetings” attitude and drains any sense of commitment from all involved. Here’s the deal: you need meetings, perhaps frequently, but you need them to be energetic, useful and in the words of consultant Al Pittampalli – modern. In Read This Before Our Next Meeting, Pittampalli lists the seven attributes of what he calls the modern meeting. This is a great framework for how to think about meetings that generate energy and action. 1. The Modern Meeting supports a decision that has already been made. 2. The Modern Meeting starts on time, moves fast, and ends on schedule. 3. The Modern Meeting limits the number of attendees. 4. The Modern Meeting rejects the unprepared. 5. The Modern Meeting produces committed action plans. 6. The Modern Meeting refuses to be informational. Reading memos is mandatory. 7. The Modern Meeting works only alongside a culture of brainstorming. Read Pittampalli’s book before your next meeting and consider making it a gift to everyone in your organization. Pittampalli’s last point can’t be emphasized enough. Brainstorming is an essential business tool as well, but it’s not the same as a meeting. Meetings are for making decisions, brainstorming sessions are to throw out ideas, discuss constraints, test theories and get feedback on ideas. You need an entirely different framework for brainstorming. You need to frame the idea, throw roles and titles and encourage big thinking. (And, don’t forget to feed everyone well.) In fact, brainstorming sessions should be held offsite in settings that encourage and foster creativity. Far too many meetings are really just protracted brainstorming sessions where little gets done. 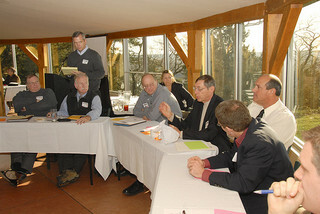 Hold advertised brainstorming sessions as special events to take advantage of this unique tool, but resist the temptation to bring this dynamic into meetings. Again, meetings are for making decisions, most everything else can be handled with email, IMs and texts. This applies to team meetings, all hands meeting and even one on one meetings. Embrace this mindset and watch what happens to the energy, accountability and action produced from meeting that nobody hates. I want to share a very simple technique today that I think can add tremendous value. I attended a meeting the other day and before we got down to the business of the agenda the leader asked us each to reflect on one thing in business and one thing personally that we were really excited about. After a moment or two we were asked to share those two items with the group. I’m sure meeting facilitators have been doing this kind of thing for years, but I’m sure we’ve all attended meetings that began by simply diving in without pause. What I observed gave me reason to believe every meeting I ever conduct should start this way – all hands meetings, one on one meetings, project meetings, planning meetings, even meetings with outside vendors and suppliers. I think the rush to get on with on it keeps us from understanding each other. With understanding comes empathy, compassion, knowledge and perspective – and from these things we are all better prepared to work with each other. Try this technique in your next networking setting and see how much deeper and more interesting your conversations are. If you have large group meetings that make sharing with the entire group unmanageable simply ask people to pair up and share individually and then call on a couple people to share with the entire group. I think you’ll find that this little, simple technique can change the entire dynamic of your meetings and eventually impact the culture of your business and quality of your relationships. So, tell me what’s one thing your totally excited about right now in your business and in your life.